Edison cylinder phonograph ca. 1899. The Phonograph cylinder is a storage medium. The phonograph may or may not be considered a storage device. A reel-to-reel tape recorder (Sony TC-630). The magnetic tape is a storage medium. The recorder is data storage equipment using a portable medium (tape reel) to store the data. RNA might be the oldest data storage medium, now replaced by DNA in most organisms. A data storage device is a device for recording (storing) information (data). Recording can be done using virtually any form of energy. People have been storing data for thousands of years, by pictures and writing. Modern storage device may hold information, process information, or both. Most often the term is used with computers. Data storage devices can permanently hold data, like files. Electronic data storage is storage which requires electricity to store and get back that data. Most storage devices that do not require visual optics to read data fall into this category. Electronic data may be stored in either an analog or digital signal format. A recording medium is a physical material that holds data expressed in any of the existing recording formats. With electronic media, the data and the recording medium is sometimes referred to as "software" despite the more common use of the word to describe computer software. 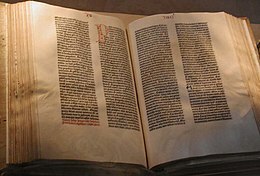 The Gutenberg Bible displayed by the United States Library of Congress, demonstrating printed pages as a storage medium. ↑ Gilbert, Walter (Feb 1986). "The RNA World". Nature 319: 618. doi:10.1038/319618a0. ↑ Bekenstein (2003) foresees that miniaturization might lead to the invention of devices that store bits on a single atom. Gilbert, Walter (Feb 1986). "The RNA World". Nature 319: 618. doi:10.1038/319618a0. This page was last changed on 19 November 2018, at 22:11.